I was, I have to admit, a little worried as I made my way down the familiar set of stairs at 45 Flinders Lane last night. 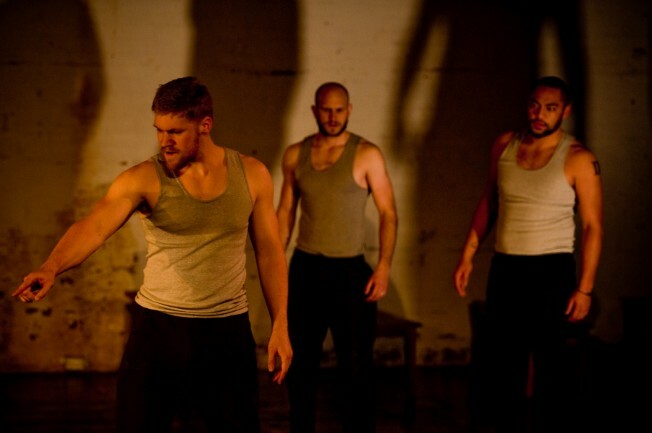 The idea of an all-male Macbeth, set in a jail, has some cheesy potential. It could have been cheesier than a deep fried wheel of King Island Blue Brie. But a number of my most trusted carrier pigeons had informed of its excellence. And, I’m happy to say, they were right. From the moment I entered the theatre I was overwhelmed by the energy, intelligence and courage of this production. Manbeth is ensemble theatre at its best. There are no ‘outstanding’ performances here; and I mean that as high praise. This is a murky, muddy world in which every player must slip and slide in and out of multiple characters in order to keep his head above water. This requires theatricality – genuine theatricality – a quality which this production summons up in spades. In fact, I’d go so far as to say I saw more of it in the first five minutes of Manbeth than can be squeezed from entire mainstage productions. And the interpretation fits the text perfectly. I understood immediately – from looking at the row of bare wooden benches, the dilapidated, stained white wall along the back of the space, the ensemble in their matching prison uniforms, the simplicity of the lighting with its long black shadows – that I had entered a disenchanted, Hobbesian world in which power was the only available language. These naked men (often literally) are little more than a pack of dogs. They circle one another, waiting for a sign to start tearing at each others throats. This image is occasionally made concrete throughout the production when the ensemble bark, howl and play out canine tableaux. Of course this is a mainstay of prison drama: the yard, the cellblock, these are dog eat dog places. Like Roman Polanski’s 1971 film, this version of the Scottish Play seems to suggest that we could – any of us – in a given moment become a Macbeth or a Lady Macbeth. And history, having begun with violence (rather like the opening sequence of Stanley Kubrick’s 2001: Space Odyssey), is destined to endlessly repeat a pattern of violence, suppression and revolution. To me this is the difference between interpretation and window-dressing. These days we see far too much of the latter, attempts to ‘modernise’ a text, to let it ‘speak’ once more (as if a true classic could forget its voice?). It is like changing the colour of the curtains or moving the furniture around and expecting the shape of the room to change. An interpretation, on the other hand, preserves the original intention or spirit of the text. Rather than bringing it forward to us, it takes us back to it. In this sense Manbeth is a triumph: it is hands down the strongest, most supple interpretation of The Scottish Play I’ve seen in a long while. A few directional things I’d like to applaud. First, clever use of space. Too many shows at fortyfivedownstairs back themselves into a corner or play in a needlessly restricted space. Manbeth manages to use the whole space effortlessly. And I’ve never seen actors climb up those goddamn pillars before! Second, I liked the way in which Macbeth and Lady Macbeth were split in two (good & bad). It worked particularly well during their soliloquies, but also helped provide an extra layer of complexity in terms of character motivation and imagery throughout. For example, with Banquo’s murder I got to see an image of Macbeth holding himself back, as if he wanted to stop what he had set in motion but could not. Third, the use of all-male cast. In any all-male scenario the issue of homoeroticism will inevitably raised. Kudos to this production for tackling it head on: rather than a sprinkling of ‘tick the box’ moments there was a genuine thread woven right through the fabric of the piece. Manbeth exceeded my expectations in every way. If you like your theatre docile, pre-masticated and lifeless then it’s probably not for you. However, if you want to be shaken by the scruff of the neck (until it almost hurts) then this is your show. NB: My only reservation was the name. Manbeth just doesn’t have the right ring? It summons up images of men rolling around in baked beans or something. Can anyone come up with a better one? In Ewan Leslie, Simon Phillips has found the perfect vessel for Shakespeare’s vilest villain. Leslie owns the stage as Richard. He drags his mangled foot across it so loudly it becomes a kind of second voice. He saws the air violently with his mangled arm and thrusts it so forcefully into his pocket that you fear he is about to burst his jacket lining. The half-demented grin on his face, and his tongue, which is often exploring the lesser-known corners of his mouth or lolling out over his lips, gives him the bizarre aspect of a maniacal child with some sort of mental defect. On one occasion I even saw a great cataract of saliva rush forth from his mouth as though he lacked control over his gastric juices. It’s an incredibly visceral, palpable performance and one that deserves to remembered, most of all for its cheeky sense of humour. Leslie brings a sense of contemporary humanity to this famously inhuman monster. It’s a joy to see him having such a good time in the role. He is constantly in conspiracy with the audience: we cannot help but like him. This binds us to him so that, in our own small way, we share in his fate. It’s a very clever piece of playing which ensures that the more serious ensemble set-pieces function in counterpoint to, rather than as an extension of, our relationship to the protagonist. Ultimately it is Leslie’s force of character which drives the production, giving it a dynamic balance of humour and menace, and it is his inexorable rise and fall that grips the audience. Which is all as it should be. we have a sense that this is not a beginning but a continuation. When Richard wins, brushes away or does away with subsequent characters (Lady Anne, his brother Clarence, the two young boys) as easily as if he were swatting at flies it never seems implausible but somehow intuitively and dramatically logical. Richard’s rise to power, we understand, will be as unstoppable as the tide of history itself. Simon Phillips’ direction has a very filmic quality to it. Filmic is a word often used in a derogatory sense in the theatre, code for something that lacks essential life. But nothing could be further from the truth here. This production teems with life. Though every drop of technical capability is squeezed from the Sumner theatre – TV screens, projections, flying props, sets and actors, trapdoors, smoke machines, translucent scrims, glass walls, rising coffins and podiums, enormous revolving sets – none of it detracts from the theatricality of the piece. It is, rather like Benedict Andrew’s mesmerising Season at Sarsaparilla a couple of years ago, an example of how well-used technologies can open up new dimensions in an old text. In Richard III the revolve allows set changes so swift and sharp that they resemble a camera cutting between scenes. After the play I was talking with one of the actors and he mentioned something which helped the penny to drop: apparently the creatives were hugely inspired by the West Wing series. They seem to have drawn on the way the camera often follows characters between rooms or down corridors (rather than cutting) which give that strong ‘halls-of-power’ feeling. In relation to Richard III this makes perfect sense considering the contemporary setting and the obvious references to US politics. Just at the moment when black-and-white film had achieved a sufficient standard of technical sophistication to enable filming to be done on location more or less at will, essentially liberating both the camera and the narrative from the closeting confines of the studio, colour film was introduced. As transformative as the look of colour would prove to be, its lighting requirements were such that in the early years, at least, location shooting was almost impossible. But once colour was introduced, black-and-white films immediately began to seem less expressive than they used to, their ‘reality effect’ loss its efficacy, until at a supreme moment of reversal black and white became (as it is now) the sign of art house expressionism. In deciding whether to shoot in black-and-white, or colour, directors had to choose between looking real, but feeling artificial, and feeling real, but looking artificial. If we take these arguments and apply them to theatre it becomes possible to see similar forces at work. With the rise of new technologies, mainstage companies are now able to ‘represent’ reality in ways that we have become accustomed to seeing it, that is with filmic resemblance. A backlash against this has led to a fetishisation of poor, trash or junkyard theatre, which revels in its aesthetic limitations and restrictions. By making a virtue out of bare necessity, and rejecting the need for versimilitude, these productions often seem to contain more life and authenticity. Like in film, these older but rejuvenated technologies (‘I will show you a man in a dog suit instead of a dog itself’) have come to possess a greater reality effect, whereas new technologies stink of false doubleness. We even find this dialectic playing out in Richard III. I am thinking of the moment towards the end of the production when Richmond and Richard present themselves to us a politicians. With the live flesh-and-blood person before us, and the simulacra of their close-up face projected behind, we are forced to compare reality with unreality. First we get the media savvy Richmond, channeling Barrack Obama, a smooth and capable orator. And then Richard comes to the podium, and in a lovely moment that endears us to him more than ever, he pauses. He cannot, or will not, read his pre-written speech. He scrunches it up, looks directly at us and launches into a froth-mouthed tirade. With his hunched back hooked over the lectern, and his glowering face all screwed up, he looks neither smooth nor capable. The strange and interesting thing is that, once again, we somehow prefer this ugly monster because he seems more real than his opponent. There will always be those who will detest the MTC, and what they do, simply because they are the MTC. Which is entirely natural: we need to maintain the rage in the independent sector in order to maintain our own sense of identity. We have to denounce culture to have counter-culture, right? But for what it’s worth, I think this is an outstanding production. It is, dare I breath the words, mainstage theatre at its best. 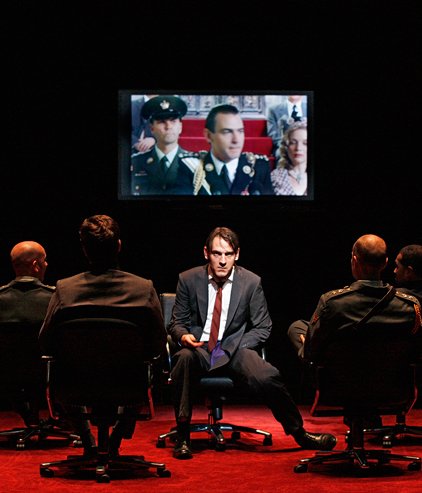 Richard III is a triumph of large ensemble, set-piece direction. Like last year’s August: Osage County, it will prove to be a huge hit for MTC, and a well-deserved one. I only have major gripe to air. 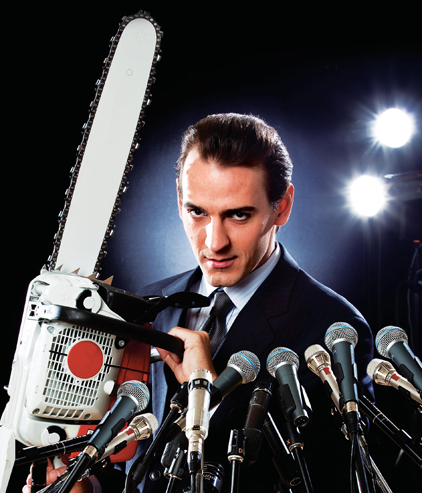 The whole night I was gleefully waiting for Richard to chainsaw one of his victims to giblets. My kingdom for a chainsaw? 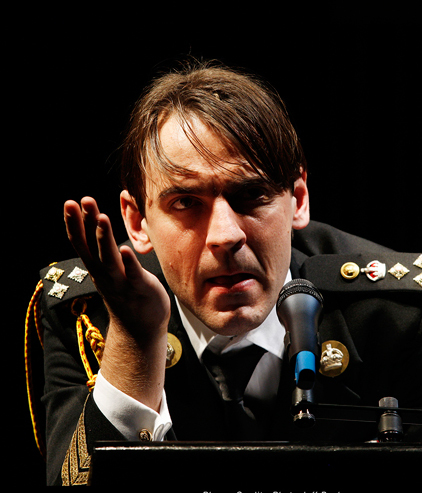 As an afterthought…Leslie’s Richard looks a lot like Hitler, don’t you think? But even more than the real Hitler he resembles Oliver Hirschbiegel’s Hitler in the Downfall, which has spawned so many great Youtube parodies, God bless ’em! First there was the History Wars. Now we have the Theatre Wars. The battle lines are drawn, the forces marshaled, the trenches dug, the artillery called in. And it’s about time, if you ask me. We need to confront these issues head on. We need to breach once and for all our great Australian silence. I know, I know, all of this must sound incredibly hyperbolic for a discussion about theatre. After all, it’s not sheep-stations, right? Or is it? If our stages are, as Shakespeare tells us, all the world, then surely whatever happens onstage must be a reflection of what happens offstage. And so, because I know there’s a hidden sting in all this, I’m being quite deliberate in choosing military metaphors. It’s important, I think; important to emphasise the fact that there is a war of a kind being fought in this country. And in fighting this war, history and theatre are not as far from each other as we often presume. If history is what hurts, then perhaps theatre is a looking-glass through which we magnify history: a specific sort of history, however, not history as fact but as representation. In other words, perhaps theatre is a way of finding out what hurts? The catalyst for all this was of course Julian Meyrick’s production of The Birthday Party. The debate around this production has been simmering for some time (as can be seen from the deluge of commentary online) but now it has flared right up. In fact, it’s become a bonfire. The difficult thing is trying to work out who’s tied to the stake: Meryrick, the critics, or the whole darned lot of them? Who wins and who loses out of this? What is at stake? And why are so many normally quiet and thoughtful people behaving so viciously towards one another? Clearly something has happened, some raw nerve has been exposed, and that alone bears close examination. Before I go any further with this, I think it’s worth saying that any production that causes this much of a stir has to have done something right. Not that the ultimate goal of theatre must be to cause disagreement. But there’s a good argument to be made that art, by definition, should get people talking, arguing and fighting for something. Let me try and briefly summarise the shots fired thus far. It all started with Cameron Woodhead’s review for The Age (not online) in which he singled out Isaac Drandic and gave him a particularly vicious drubbing (leaden and inert…an actor reciting lines in the earliest phases of rehearsal). This was followed by Alison Croggon’s review for The Australian and a series of longer reflections on Theatre Notes. What is missing…is the uneasy sense of impending terror that underlies the laughter. The human ugliness and savagely bent eroticism that make the play so disturbing are rendered in soft focus; comic, rather than frightening. On the night I saw it, Drandic was a blank: he responded catatonically, with none of the repressed violence so characteristic of Shaw’s performance in the film. This gives the performance nowhere to go, since in the final scene he really is catatonic; because he has been emotionally blank from the beginning, his inability to speak is much less devastating. And it neutralises many of the exchanges in the play, as Stanley is always a passive victim. I’m sure both critics said what they felt…but in shaping their responses, everything about The Birthday Party that is different, new, challenging and important has been swept aside. You might get the impression from the reviews that cross-racial casting…went on all the time, instead of the reality, that it almost never happens. An indigenous cast nailing The Birthday Party is an indication that a new era in casting has arrived. It’s a shift from why (why cast Aboriginal actors) to why not (why not cast Aboriginal actors). And the point is a good one. The Birthday Party, with less pomp and ceremony than one might expect, has ushered in a new era of casting practices (at least, we hope so). In this day and age, every director worth their salt should be asking themselves, as Lee Lewis says, what the political significance is of having an all white cast, and what that says about our national identity and how it is projected onstage. This applies not just to Aboriginal actors, but actors of all different racial backgrounds. But this is simply not the sort of thing that critics think about when they review a show. And fair enough, that would be to review a show by what it achieves offstage and not what it achieves (taking casting as a given) onstage. A critic cannot help but compare what they see on the night with what they envisage in their mind’s eye, in a Platonic sense. They make an aesthetic judgment and inform us whether desire eclipsed reality or vice-versa. And this is perfectly reasonable; after all, it’s what critics do. So how do we steer a course between these two perspectives, both of which are valid and deserve our sympathy? Julian’s rejoinder may be at times plaintive and overwrought, but it’s sincere, and comes from what I believe is the right place. Similarly, Alison’s response on Theatre Notes, makes an irrefutable argument for the necessity of clear headed criticism. Since the furore broke there has been such an outpouring of words (mainly on Theatre Notes) that I think it’s fair to say that this is no longer an isolated spat but a much larger and more symbolic tussle for supremacy between cultural creators and cultural interpreters. Unfortunately, a great many of the hand grenades lobbed have been from behind the facade of anonymity, which I find quite difficult to swallow. The unwritten law is that artists should never respond to negative criticism because it only bolsters the critic’s power and ego. Julian Meyrick should be grateful to critics…who pay him the courtesy of telling him the ways in which a production of his may fail. Now, I don’t mean to point out the obvious, but critics don’t visit the theatre out of courtesy. They do it because they get paid to do so. Whereas a director, like Meyrick, is paid to create the theatre they see. So, as a simple logic would have it, it is they who should be grateful, for it is his job that prima facie provides them with theirs. The other lesson we learn from Craven is that, in this debate, we are dealing with a theatre production for heaven’s sake and not with interventions and land rights. Which takes me back to the start of this mini-essay and my basic premise that history and theatre (or politics & theatre) are not so far apart as we think. And, if we are willing to concede that, then we must be willing to concede that perhaps critics should be applauding diverse ethnic casting (given that casting is the main vehicle through which we can change conservative theatre pratices). Perhaps, if I can add my two cents, at the heart of this dispute is not so much a disagreement over whether a particular production (acting, directing, casting etc) is any good, but rather a confusion as to where we think Australian theatre should be headed. Julian Meyrick thinks one thing, and acts on it, putting his casting where his mouth is. Alison Croggon and Cameron Woodhead think another, and tell us whenever a production doesn’t match up with what that. All three are trying to have an impact on the unfolding of our cultural history. And all three, no doubt, are sadenned by the fact that blood has been spilt over the performance of a wonderful play by Harold Pinter. Personally, it does saddens me to hear a devoted and talented director at the top of his game publicly ponder whether it’s even worth continuing. But maybe this is exactly what we need? A little blood spilt. And maybe, just maybe, it’s exactly what surly old Harold would have wanted? This has turned into a huge rant, and if you’ve made it this far, thanks for sticking with me. There can be no doubt that there have been too few non-white faces on our mainstream stages. No director in Australia would disagree with that. And in this, as always, the argument has not been so much about what we want to see, but how to make it happen. Unfortunately, we haven’t proven up to the task, and have fallen far behind other parts of the world. And so, we can no longer nod our heads with Shakespeare and say that all the worlds a stage. Because, the truth is, our stages reflect only a small part of it. Whatever we think The Birthday Party good, bad or otherwise, we cannot deny that it is an important production. I myself argued that it was well worth seeing. And I know plenty of people who saw it and loved it. And plenty more who blatantly disliked it. I don’t have a problem with any of that; as I said, I think it’s a mark of artistic integrity if a production is divisive. I guess where I find this whole debate a little confused is that, what is worthy about the production (in terms of process) has not been the major focus, whereas its critical reception and flaws have been. And this has pulled focus from what could have been more of a celebration. I only hope that this debate helps us to better understand each other and that, when the last shot is fired, we can reach a truce that involves a true reassessment of what, why, and how we do what we do in Australian theatre. Let’s not make the Theatre Wars a lasting part of our culture like the History Wars. Let’s make them a step in the right direction.